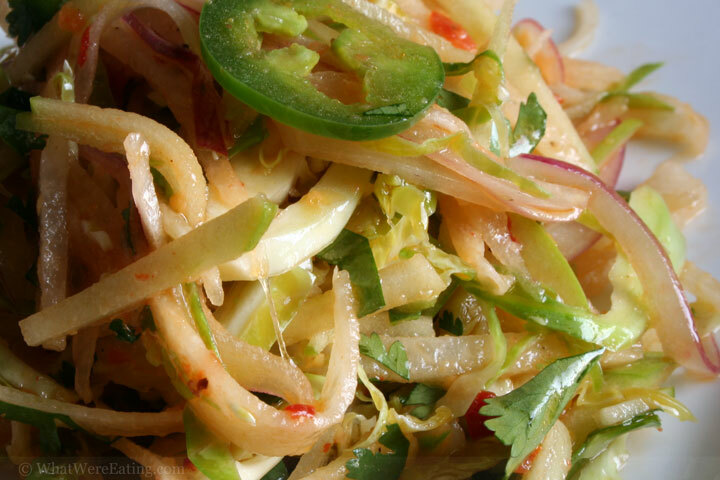 In an attempt to break away from the heavy holiday foods (for at least one meal), we’re eating a spicy thai jicama salad filled with finely shredded fresh jicama, granny smith apples, red onions, brussels sprouts, and jalapenos. For an extra added kick the salad is tossed with a chili-lime vinegarette. The salad is crispy, spicy, and sweet all at the same time and the asian peanut oil really allows the peanut-y flavor to shine through and bring the whole dish together. A:Alright guys, this one is perfect for a pre-holiday meal, considering the loads of heavy food one is bound to consume during the month of December! T & I really dug into this salad with gusto and were left wanting some more so badly that i had to make it again the next day! We did what i suggest in the recipe, and served it with thin slices of chicken breast. That’s definately a great way to go. Now this salad isn’t exactly for the whimpy at heart… if you can’t stand the heat get the hell out this salad! okay, i suppose you could also just eliminate the shaved jalapeno, but personally that’s one of my favorite parts! I wish everyone a very delightful holiday season, what ever you may celebrate! In a medium sized mixing bowl add the jicama, apple, onion, brussels sprouts, jalapeno, and cilantro. Squeeze the juice from one lime over the ingredients, then toss to coat. This will help prevent the apple from oxidizing and turning brown. In another mixing bowl add the garlic chili sauce, mustard, ginger, juice from the other two limes, and anchovy paste. Whisk to blend. Continuously whisk the ingredients while drizzling in the peanut oil to form an emulsified vinegarette. Pour the vinegarette over the jicama salad and toss to coat. Season with salt and pepper to taste. Salad is best served chilled (although good at room temperature as well). To make this a complete meal add a simply seasoned and seared thinly sliced chicken breast. Enjoy! I was on Thai food last night too – great minds think alike obviously ;). I don’t think I know what Jicama is. Is it a type of fruit? You’re so lucky for getting Oriental ingredients over there! Here we do quite well for Indian food but getting any remotely obscure stuff from further east is a pain! Ahhh…. so asian peanut oil actually tastes of peanuts? I’ll have to investigate the Thai supermarkets to see if I can get some. hope you and tyler have a wonderful christmas and get lots of loot! This salad was sooo good. It seems like most people can’t get jicama, so Amanda you’ll have to find an alternative for this one. ros, i completely agree! great minds definately think alike. we are particularly lucky with all the asian products we can get in california, not all of the u.s. is so lucky! you know, i had never had a peanut oil actually taste so much like peanuts before this bottle i just bought, it’s definately good for things like this… but there are plenty of thing that i want the flavorless peanut oil for, too! geez… aria… not the dreaded LAX! i hope you survived the travels alright (and i hope you didn’t have to travel through denver!). we hope you have a great one too! thanks, nicole! i didn’t realize that it was such a rare comodity! at least when you get back to california next year you will have an endless supply of it! t-gravy (or shall i call you pepita brittle), i’m thinking people could just, like… triple the apple and get pretty much the same effect. the apple is a little sweeter but they pretty much have as similar taste and crispness to them. miss ya. That looks kind of lovely! Wishing both of you a merry Christmas and a Happy New Year! I am doing a roundoff greeting on my blogroll. I love Thai food and this looks like a yummy recipes. I’ll try it soon. Why? Why the Brussels sprouts? You tryna make me NOT read your blog anymore?!?!??! Jicama is found at Hispanic mrkts. I will make a weight watchers recipe with this. Very healthy eating. Thanks. can order it. Jicama is way too good to be subbed out!! This looks great. If it were fall, I’d make this asap. I love the interesting combination of ingredients, and your blog is beautiful. YUM! What an amazing looking salad. My husband needs meaty salads and this looks like it fits the mold. I bet I’ll have to turn down the spice for him though.. don’t want to hurt him!